The main campus library was named for Daniel Harvey Hill Jr., a professor of English and bookkeeping who became president of NC State. Do not use a comma after "Hill." See entry for NC State University Libraries. Data is the plural of datum. The word should generally take a plural verb. The study data show that carbon outputs can be reduced by 16 percent. When using a department's formal name, be sure to capitalize appropriately: the Department of Agricultural and Resource Economics. When referring to the department generically or informally, only capitalize proper nouns: the agricultural and resource economics department, the English department. The Department of Mathematics is hiring new faculty. The Math Department is hiring new faculty. For the proper title of a particular department, refer to the NC State University Undergraduate Catalog, which can be accessed online. DELTA on second reference or when used in internal communications. Both the AP and NC State discourage the use of "Dr." as a title in front of someone's name in most cases. It's preferable to state the person's academic rank and field of expertise: Derek Ham, assistant professor of graphic design, is an expert in virtual reality. Do not hyphenate this word. Denotes either a retiring full-time faculty member who has been recognized by the chancellor, or a full-time staff member recognized by the board of trustees, for dedicated service at NC State. It is an earned rank and comes with commensurate rights and privileges. Lowercase unless part of a name or title. March 7 marks the anniversary of the founding of the university. The Founders' Day event commemorates the 1887 passage of a bill in the state legislature that provided for the founding of a college to teach agriculture and mechanic arts. The governing body of the 17-campus University of North Carolina system, of which NC State is a constituent institution. See entry for The University of North Carolina for a list of all 17 campuses. 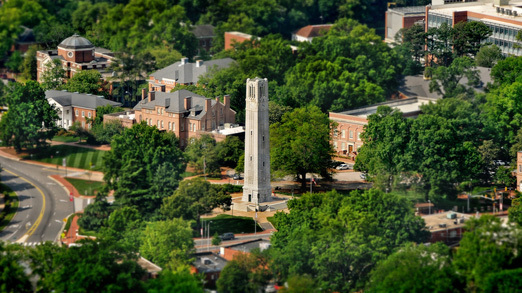 The college administers and grants graduate degrees across 10 of the NC State colleges that have graduate degree programs. (The College of Veterinary Medicine grants its own graduate degrees.) When referring to the formal institution, capitalize the name; in general references, lowercase it. The NC State Graduate School offers 100 percent electronic processing for graduate theses and dissertations. She went to graduate school at some other university. She attended the Graduate School at NC State. This museum, a unit of Arts NC State, uses the ampersand in its name. NC State's first building, Holladay Hall, was originally called the Main Building. The cornerstone was laid in August 1888, and the building was opened Oct. 3, 1889. The building was renamed for the college's first president, Alexander Quarles Holladay, in 1915. Today Holladay Hall houses the offices of the chancellor and other administrative offices. Gov. James B. Hunt, Jr. addressed the audience. The indigenous people of that region subscribe to a Weltanschauung that views the health of the people as dependent upon the health of the land. The Afro-Brazilian drum troupe Grupo Cultural Olodum performed on Paul Simon's album Rhythm of the Saints. The commedia dell'arte provided a way for the artistic classes to comment on political issues of the day. Titles of large works — books, journals, magazines, newspapers, albums, television shows and the like — are italicized. Being Written is a novel by NC State alumnus William Conescu. The professor's research was published in the Journal of Materials Sciences. The New York Times has requested an interview with the chancellor.